The name “The Globe” elicits familiar echoes from the past; memories of previous venues with the same moniker. 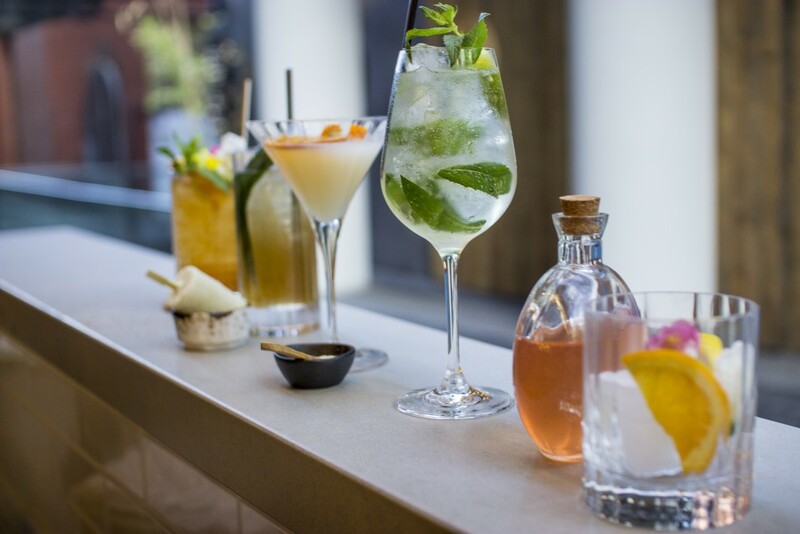 Erected in the same location as the original Globe Hotel, the new offering is made of three venues in one, the bar, the eatery and the lane – a small cocktail and wine lounge perfect for after work drinks. The large garden bar can be seen when walking through 140 William in Perth, with visitors soaking up the sunshine, and enjoying the boutique beers, ciders, and a wine list designed by 2014’s Gourmet Traveler Sommelier of the Year Jeremy Prus. 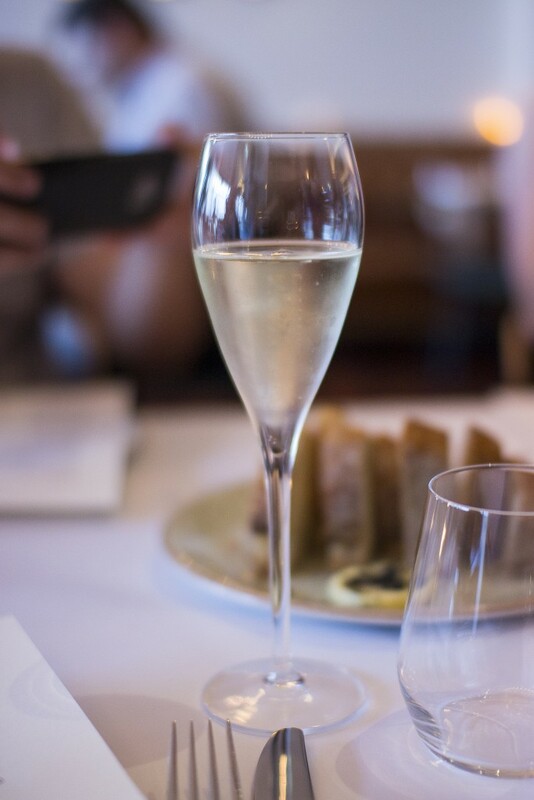 I was pleased to receive an invitation to attend a dinner at The Globe recently, joining other foodies at The Lane to kick things off with some cocktails. 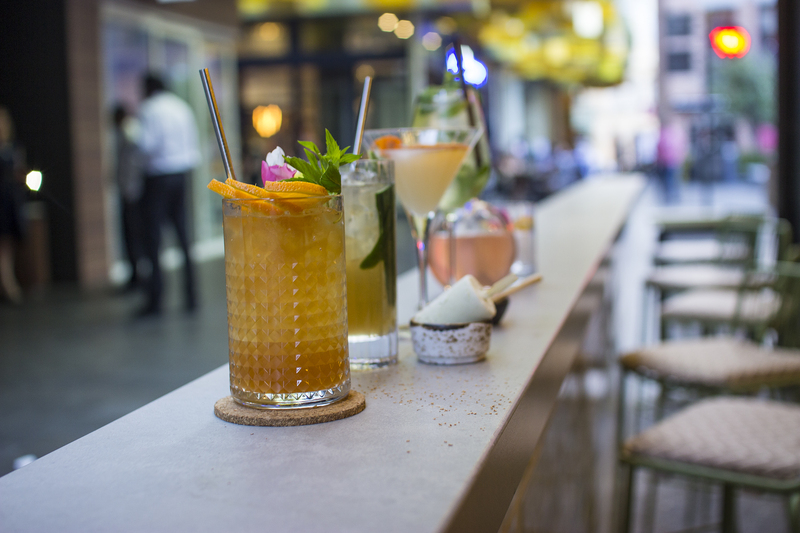 It was a hot balmy night, so drinks definitely felt in order. 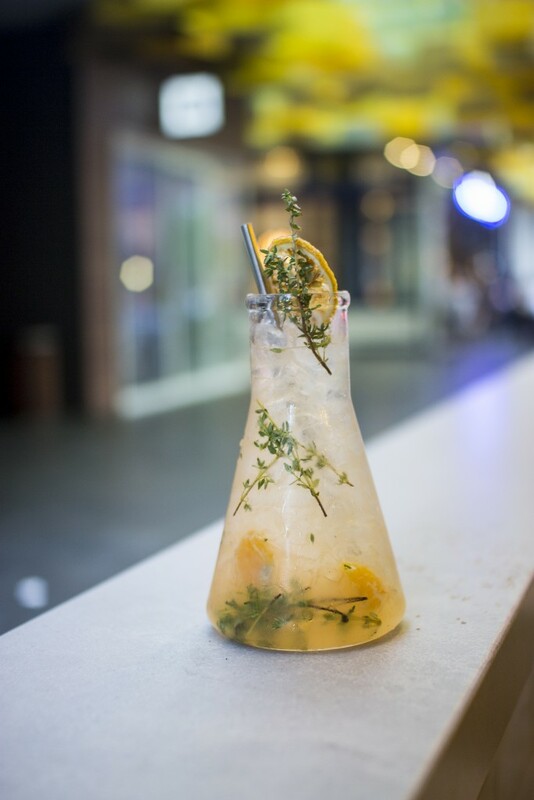 Every drink we tried was summery, well balanced and had a bit of flair to them. I thought the prices were really reasonable, and I know I’ll be back to try more in the future. 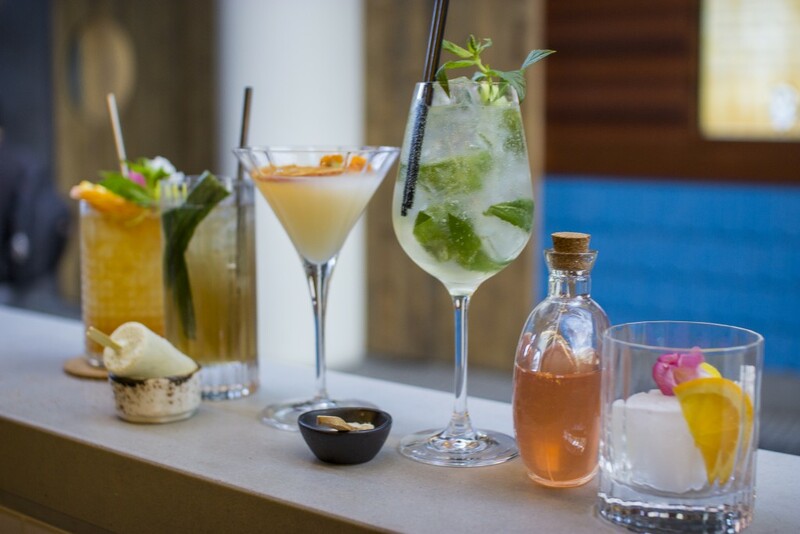 I do love my cocktails! After we finish our cocktails, we make our way to The Eatery, sitting down in the centre of the restaurant at a long table. The lighting is intimate and low, which is great from an ambiance perspective – though not so friendly on my camera. 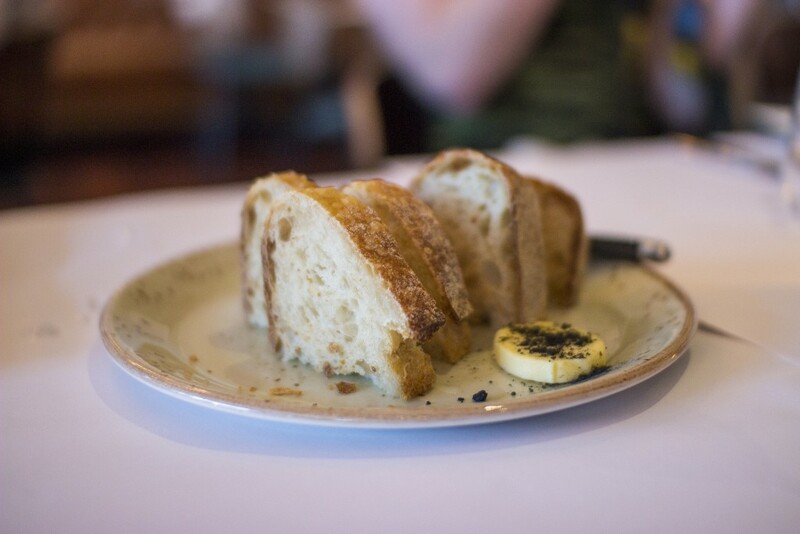 A fresh glass of prosecco and sliced bread with salted ash butter ($2.50 per person) greet us, but it’s not long before dish after dish starts pumping out from the kitchen. Head Chef Alexandra Haynes has taken the helm with creativity and a real passion for fresh, seasonal, boutique ingredients. From the starters section of the menu came out the eggplant with tomato, sultana and rosewater yoghurt ($10.00), whipped feta with pickled crudités ($9.00) and the beetroot, yoghurt and cardamom dip ($8.00). For me, the eggplant was just plain incredible – and something I highly recommend. 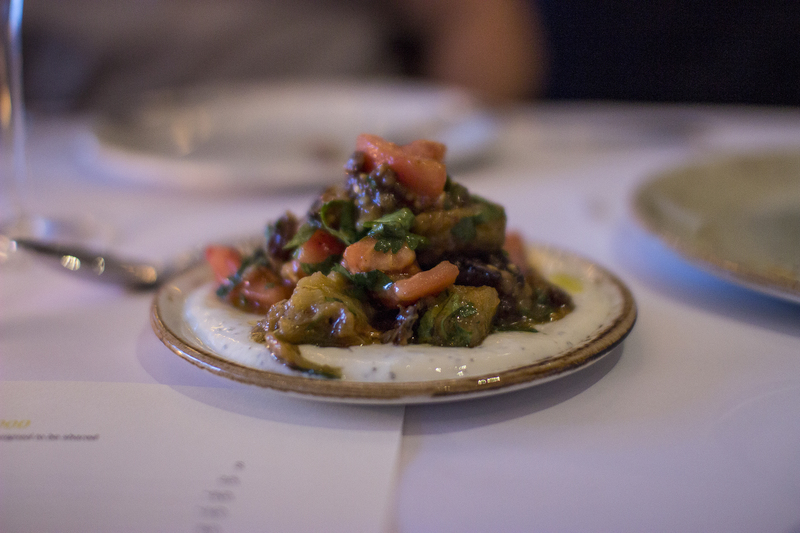 Sometimes eggplant isn’t cooked all the way through but here it was spot on, bringing out that unctuous creamy quality that contrasted against the sweet tomato and fragrant yoghurt. 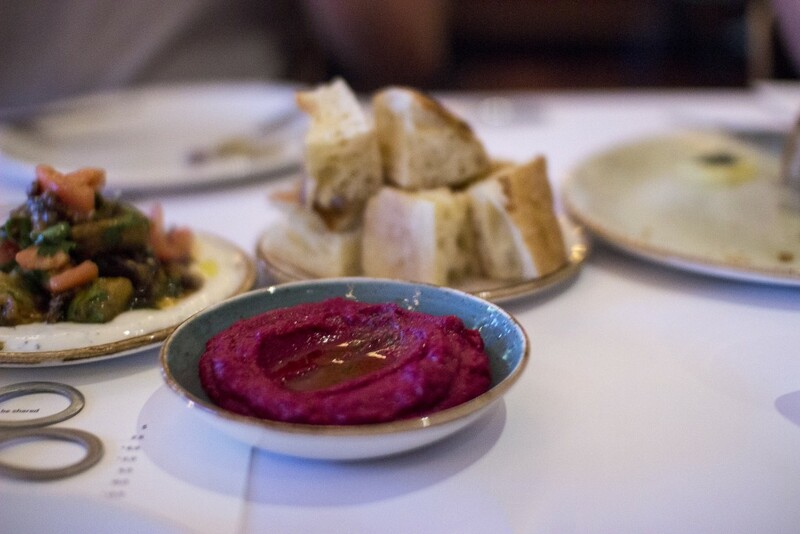 The beetroot dip was punchy and earthy, with a vibrant purple colour that looked amazing spread onto the fresh bread. 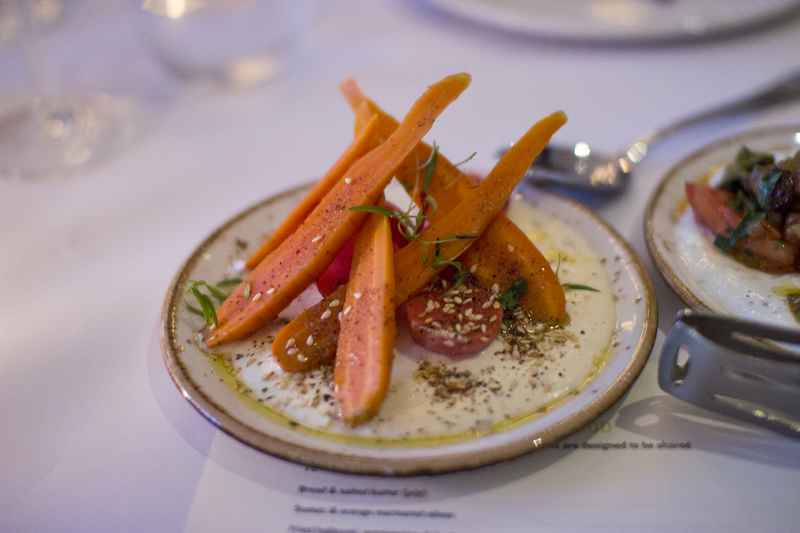 However the crudités for me didn’t hit the mark as they were extremely sharp from the pickling – they smacked you in the face with their vinegar flavour, and sadly was a bit too much for me to handle. I did like the whipped feta though – after all, feta makes everything better! I really like the idea of these small share plates, which reminds me of a tapas style meal but could still be seen as a breakdown of entrees before choosing mains. 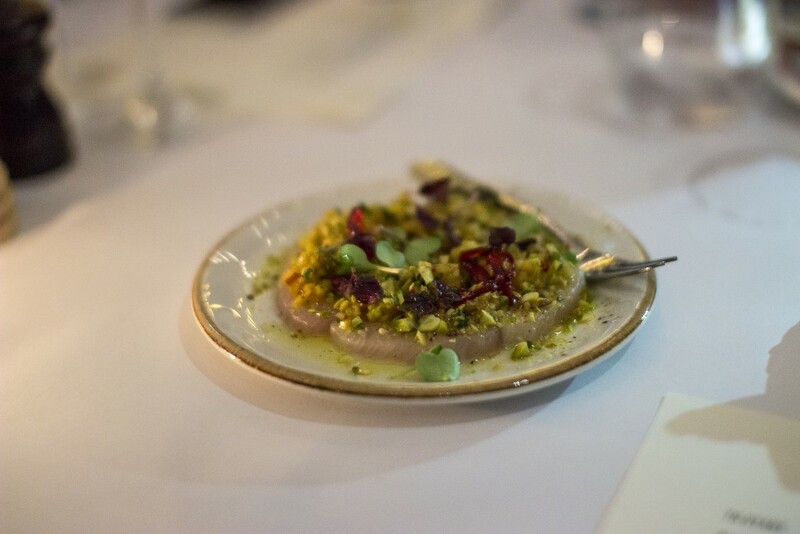 The kingfish (market fish) carpaccio with chilli, pistachio and peach ($12.00) was a welcome rendition of a classic dish, with bursts of flavour overlaid on that delicate seafood. I really enjoyed the textural element from the nuts, and the way it offset against the melt in your mouth flesh. 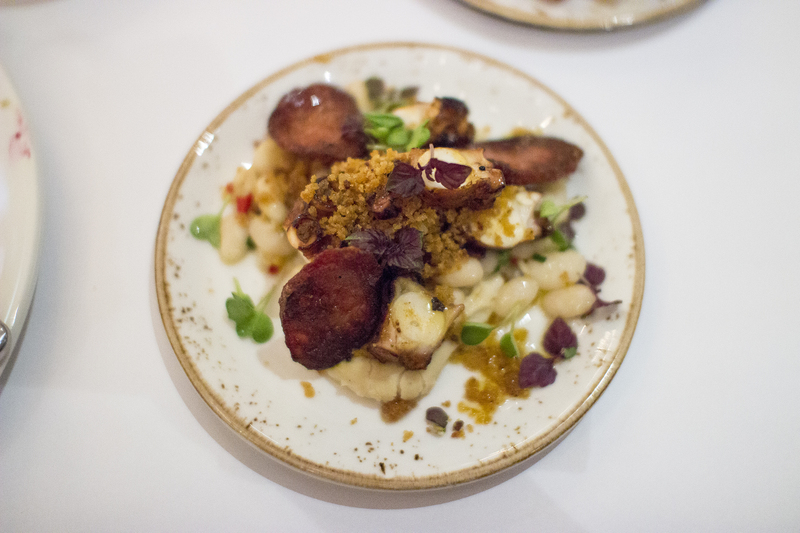 The octopus with lemon, white bean and chorizo ($12.00) was another of my favourite dishes for the evening. 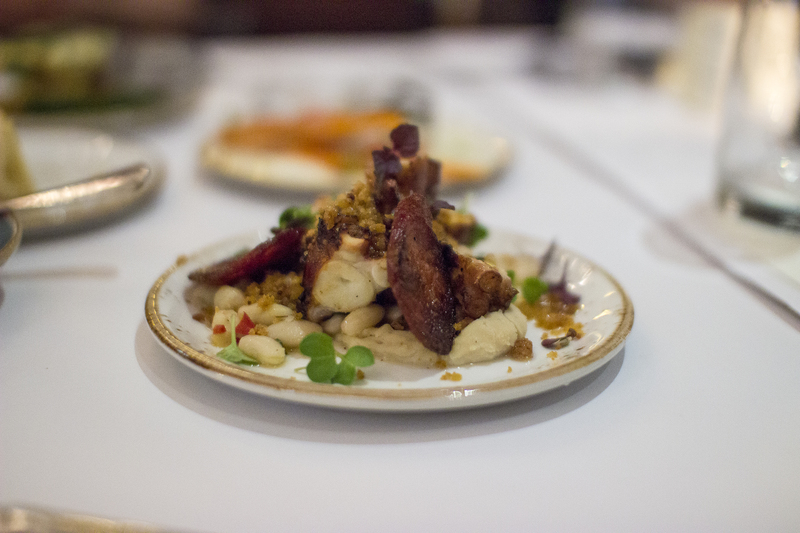 I just love grilled octopus which imparts this incredible smokey flavour, and works in perfect harmony with the white bean. I actually think I ate the majority of this small plate thanks to my convenient location in the middle of the table… not that I was complaining! 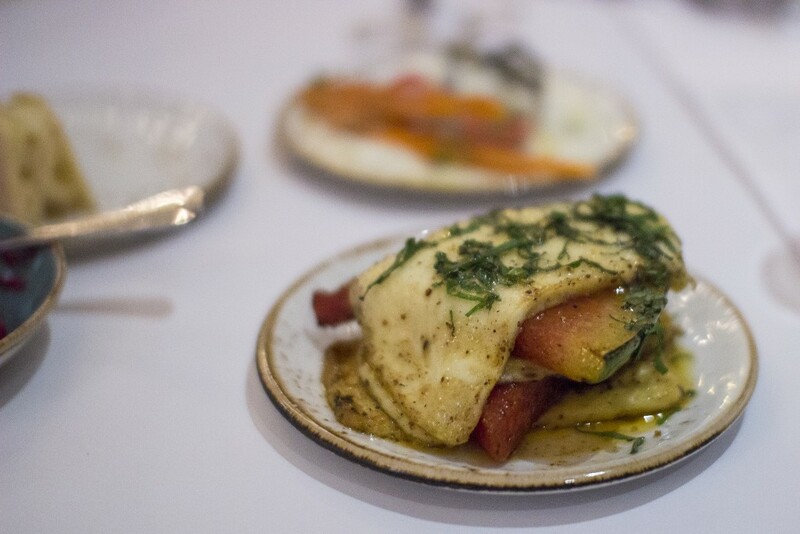 The final small dish to come out as the fried haloumi with watermelon and harissa ($11.00). I’ve never tried this kind of flavour combination of the melted cheese with the juicy watermelon, but it was good! 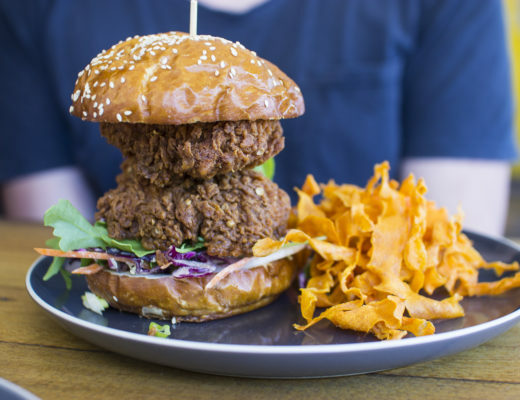 Sweet, salty, and spiced, this ticked all the boxes and was playful – evidence that they’re serious about food here but don’t actually take themselves too seriously. 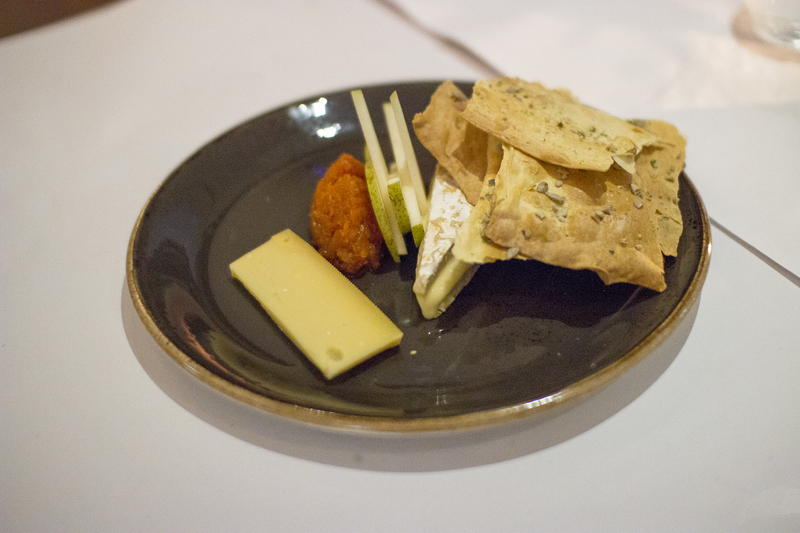 The mains section of the night proved to be quite a generous affair, with plate after plate making their way to our table. 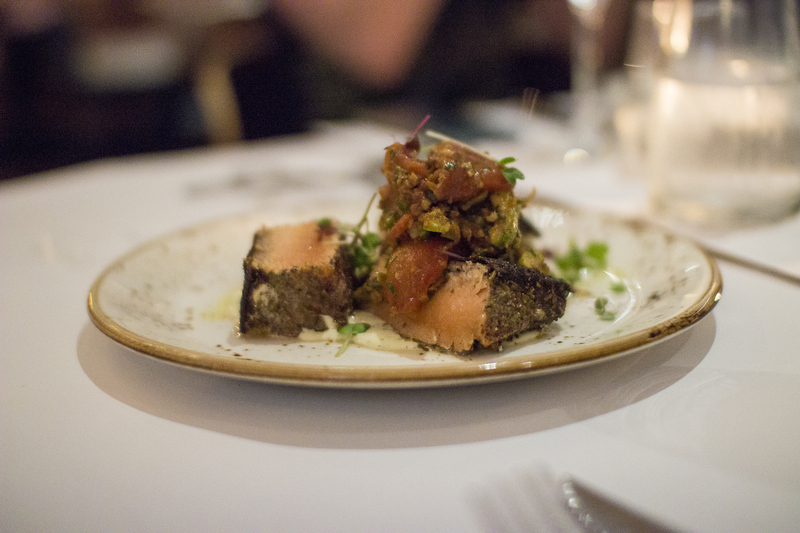 The Tasmanian salmon with green tahini, almonds and olives ($30.00) was perfectly pink in the centre, the flesh flaking away with almost no effort. I was pleased to see the crispy skin, which was well seasoned and utterly morish. 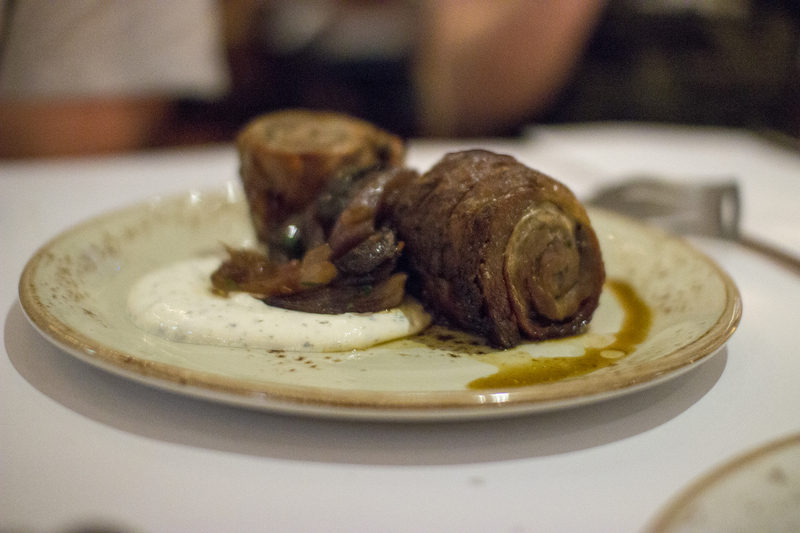 The pot roasted lamb breast with afghan yoghurt and eggplant ($29.00) was the star of the meat dishes. It was quite a generous serving, and the meat was melt in your mouth tender. The mediterranean flavours were classic and yet inventive at the same time, and everyone around me was swooning at how delicious this dish tasted. 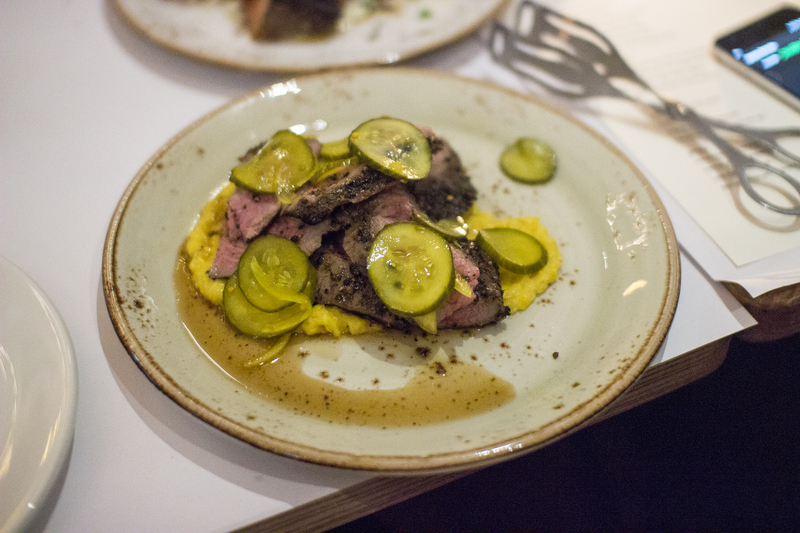 The pepper crusted flank steak ($26.00) was a real crowd pleaser, sitting atop a sweet corn relish with a cucumber pickle. The meat was juicy and finely sliced, offering bursts of pepperiness in each bite. 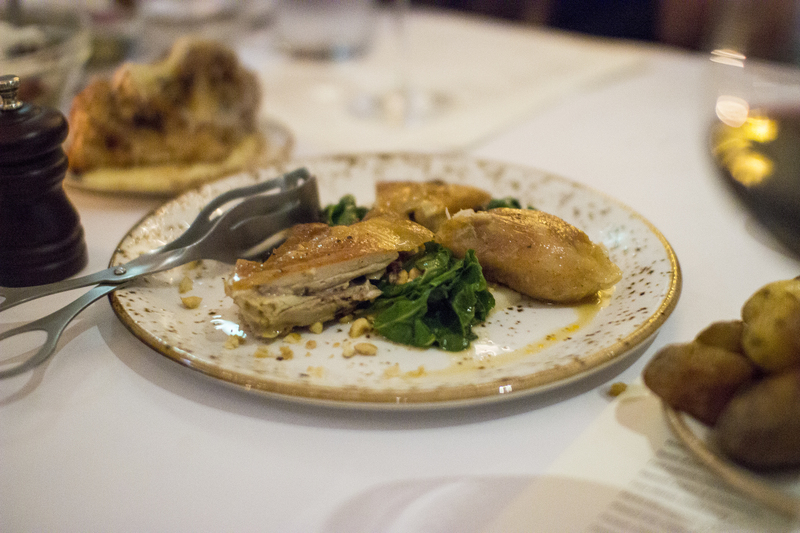 I didn’t try the confit chicken ($28.00) with silverbeet, raisins and hazelnuts, but it looked a treat with it’s crisp skin. However feedback on the table was that some pieces were quite dry – though I didn’t experience this for myself. I did however try all of the vegetable sides because I do tend to gravitate towards my veggies. After all when you have chicken fat potatoes ($9.00), can you really blame me? 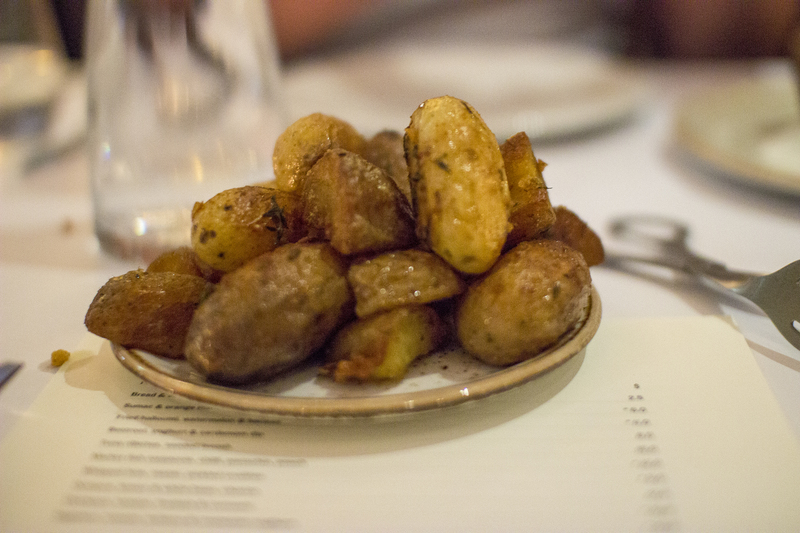 Crisp on the outside, fluffy on the inside. Yum. The roasted cauliflower with comte and almond ($11.00) was a real show stopper on a plate. It was a small serving size, but wow it was delicious with that oozy cheese coating and the crunchy mouthfuls of savoury nuts. 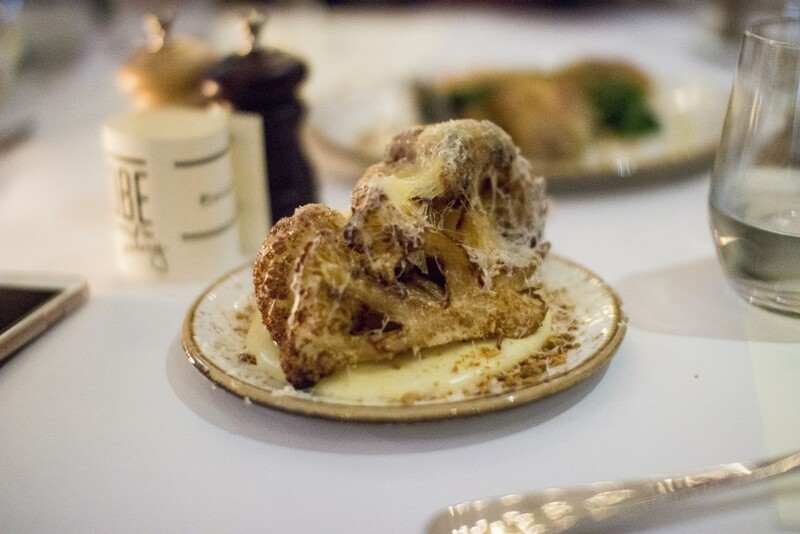 I will happily and purposefully order this next time I head back to The Globe… and I probably won’t share it! 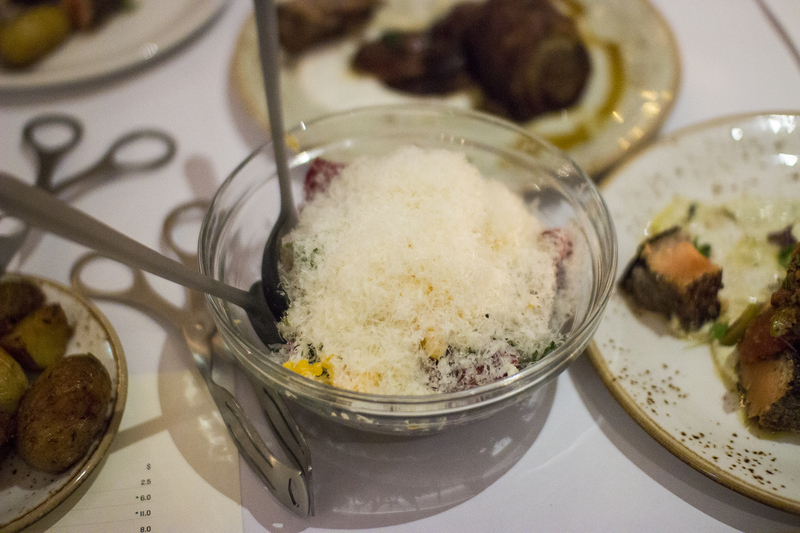 The radicchio, pecorino, crouton, green olive and egg salad ($10.00) was fresh and laden with fluffy grated cheese – it felt like an inventive take on a classic caesar salad. 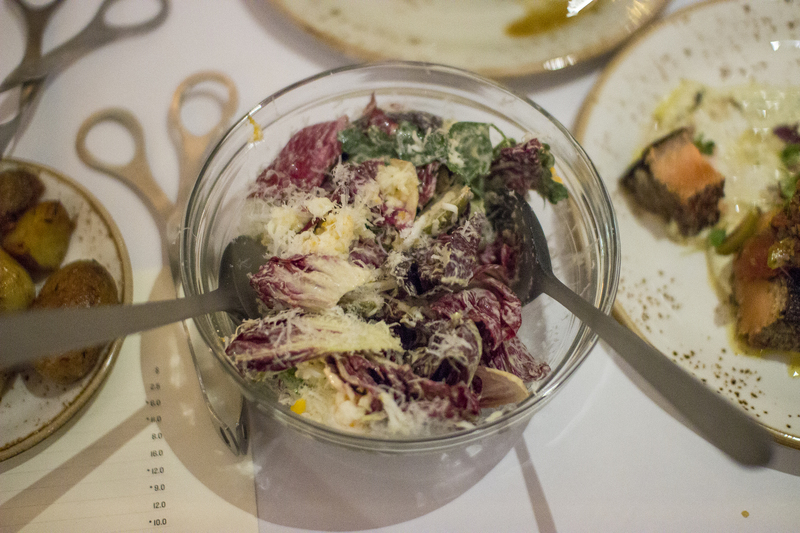 For me I found the radicchio a bit too bitter and dominating, but I tend to prefer this ingredient as an accompaniment, not the main star on the plate. 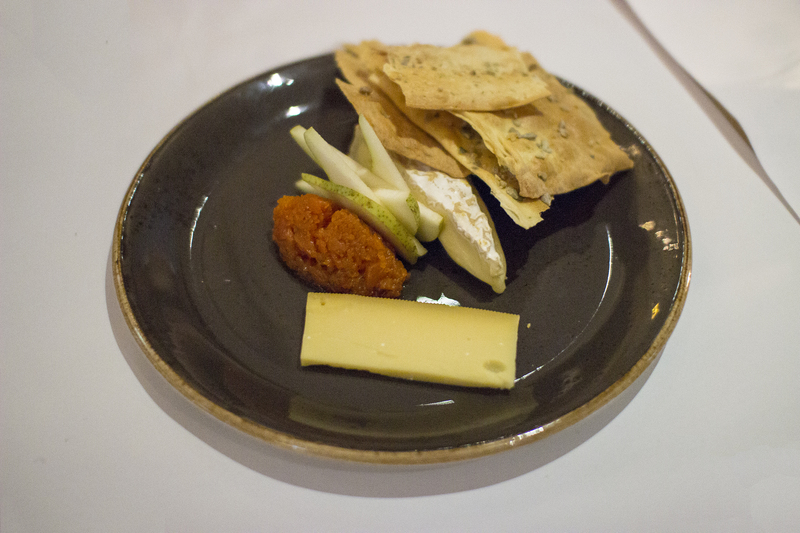 While we were all moaning and groaning after a little too much indulging in dinner, we were still all too happy to finish things off with a selection of cheeses with house-made lavosh and carrot jam. 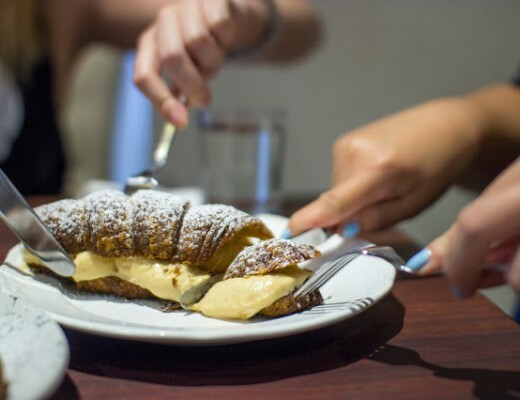 Ending in a sweet note is normally my preference, but cheese is still very much a priority – I just never understand when people aren’t fussed by cheese because I tend to revolve many of my food decisions around it! From the depths of the old, can spring new life – and that’s the case of The Globe in Perth. It brings a bit of old school charm, with some modern finesse. I thought that our dinner was enjoyable and generous, with some bold and impressive flavours. While I didn’t love all of the dishes, the majority of those I tried (and in particular the cocktails) were tasty. 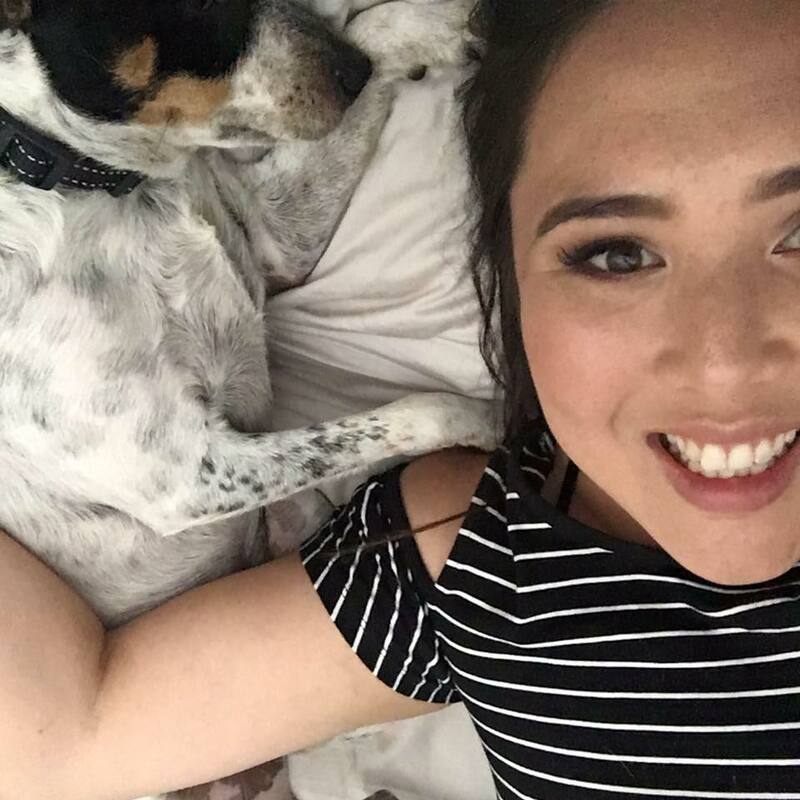 I’m definitely going to return on my own to try it again for myself outside of a blogging event. We’ve had the bar food which was fantastic.???????? Going back again this time to the cocktail lounge ☺??? ?tomorrow ☺??? ?